The Biltons Have Visitors. Myrna Does The Right Thing!! She Brings Them To a Tournament!! Call it Friendship; Call it Thanksgiving; Both are even better when Shuffleboard is in the loop!! Just ask Myrna Bilton!! Could we have an International Event in Switzerland?? Myrna Speaks: Dear Stan: We have had the pleasure of friends Stefanie and Christina Della Torre from Switzerland visit us. The weather has been perfect for them to enjoy the beaches. The timing was right for them to watch a district shuffleboard tournament that was held at Jamaica Bay. Herman Lansink, president of Jamaica Bay Shuffleboard Club made them feel welcome and shared his love of shuffleboard with them. It is heart warming for me to see how shuffleboard has grown. 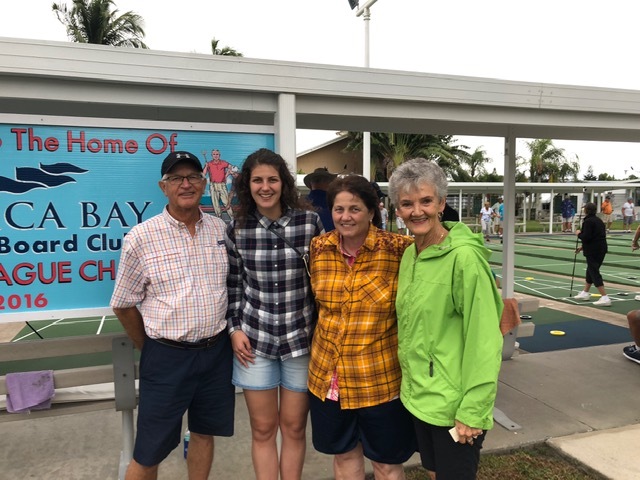 When we plant a “shuffleboard seed” …….it is so rewarding to reap the many benefits…..like friendships from around the world to share in this game of shuffleboard that we all love to play. 1 Response to The Biltons Have Visitors. Myrna Does The Right Thing!! She Brings Them To a Tournament! !